/var/run/utmp (which logs currently open sessions) is used by who and w tools to show who is currently logged on and what they are doing, and also by uptime to display system up time. /var/log/wtmp (which stores the history of connections to the system) is used by last tool to show the listing of last logged-in users. /var/log/btmp (which logs failed login attempts) is used by lastb utility to show the listing of last failed login attempts. In this post I'll show you how to use utmpdump, a simple program from the sysvinit-tools package that can be used to dump these binary log files in text format for inspection. This tool is available by default on stock CentOS 6 and 7. The information gleaned from utmpdump is more comprehensive than the output of the tools mentioned earlier, and that's what makes it a nice utility for the job. Besides, utmpdump can be used to modify utmp or wtmp, which can be useful if you want to fix any corrupted entries in the binary logs. As we mentioned earlier, these log files, as opposed to other logs most of us are familiar with (e.g., /var/log/messages, /var/log/cron, /var/log/maillog), are saved in binary file format, and thus we cannot use pagers such as less or more to view their contents. That is where utmpdump saves the day. As you can see, the output formats of three cases are identical, except for the fact that the records in the utmp and btmp are arranged chronologically, while in the wtmp, the order is reversed. Each log line is formatted in multiple columns described as follows. The first field shows a session identifier, while the second holds PID. The third field can hold one of the following values: ~~ (indicating a runlevel change or a system reboot), bw (meaning a bootwait process), a digit (indicates a TTY number), or a character and a digit (meaning a pseudo-terminal). The fourth field can be either empty or hold the user name, reboot, or runlevel. The fifth field holds the main TTY or PTY (pseudo-terminal), if that information is available. The sixth field holds the name of the remote host (if the login is performed from the local host, this field is blank, except for run-level messages, which will return the kernel version). The seventh field holds the IP address of the remote system (if the login is performed from the local host, this field will show 0.0.0.0). If DNS resolution is not provided, the sixth and seventh fields will show identical information (the IP address of the remote system). The last (eighth) field indicates the date and time when the record was created. Here are a few simple use cases of utmpdump. 1. 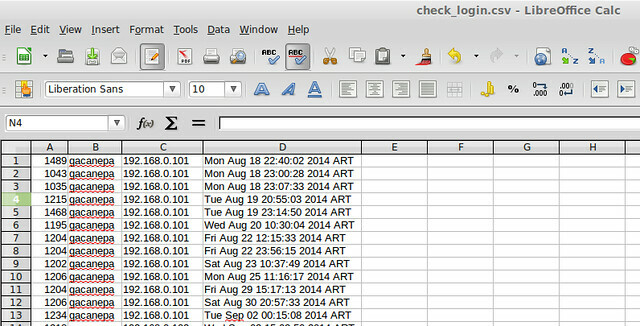 Check how many times (and at what times) a particular user (e.g., gacanepa) logged on to the system between August 18 and September 17. If you need to review login information from prior dates, you can check the wtmp-YYYYMMDD (or wtmp. [1...N]) and btmp-YYYYMMDD (or btmp. [1...N]) files in /var/log, which are the old archives of wtmp and btmp files, generated by logrotate. 2. Count the number of logins from IP address 192.168.0.101. 3. Display failed login attempts. In the output of /var/log/btmp, every log line corresponds to a failed login attempt (e.g., using incorrect password or a non-existing user ID). Logon using non-existing user IDs are highlighted in the above impage, which can alert you that someone is attempting to break into your system by guessing commonly-used account names. This is particularly serious in the cases when the tty1 was used, since it means that someone had access to a terminal on your machine (time to check who has keys to your datacenter, maybe?). 4. Display login and logout information per user session. In /var/log/wtmp, a new login event is characterized by '7' in the first field, a terminal number (or pseudo-terminal id) in the third field, and username in the fourth. The corresponding logout event will be represented by '8' in the first field, the same PID as the login in the second field, and a blank terminal number field. For example, take a close look at PID 1463 in the above image. On [Fri Sep 19 11:57:40 2014 ART] the login prompt appeared in tty1. On [Fri Sep 19 12:04:21 2014 ART], user root logged on. On [Fri Sep 19 12:07:24 2014 ART], root logged out. On a side note, the word LOGIN in the fourth field means that a login prompt is present in the terminal specified in the fifth field. So far I covered somewhat trivial examples. You can combine utmpdump with other text sculpting tools such as awk, sed, grep or cut to produce filtered and enhanced output. As represented with three blocks in the image, the filtering logic is composed of three pipelined steps. The first step is used to look for login events () triggered by user gacanepa. The second and third steps are used to select desired fields, remove square brackets in the output of utmpdump, and set the output field separator to a comma. Of course, you need to redirect the output of the above command to a file if you want to open it later (append "> [name_of_file].csv" to the command). In more complex examples, if you want to know what users (as listed in /etc/passwd) have not logged on during the period of time, you could extract user names from /etc/passwd, and then run grep the utmpdump output of /var/log/wtmp against user list. As you see, possibility is limitless. This can be useful when you want to remove or fix any bogus entry in the binary logs. To sum up, utmpdump complements standard utilities such as who, w, uptime, last, lastb by dumping detailed login events stored in utmp, wtmp and btmp log files, as well as in their rotated old archives, and that certainly makes it a great utility. Feel free to enhance this post with your comments. Gabriel Cánepa is a GNU/Linux sysadmin and web developer from Villa Mercedes, San Luis, Argentina. He works for a worldwide leading consumer product company and takes great pleasure in using FOSS tools to increase productivity in all areas of his daily work. When he's not typing commands or writing code or articles, he enjoys telling bedtime stories with his wife to his two little daughters and playing with them, the great pleasure of his life.